NO PURCHASE IS NECESSARY TO ENTER OR WIN. THIS IS A CONTEST OF SKILL AND CHANCES OF WINNING DEPEND SOLELY ON THE SKILL OF THE ENTRANT. Void where prohibited or restricted by law. CONTEST BEGINS AT 12:00:00 AM (PT - LOS ANGELES TIME) ON JULY 12, 2013 AND QUALIFYING ENTRIES MUST BE RECEIVED BY 11:59:59 PM (PT - LOS ANGELES TIME) ON AUGUST 12, 2013 (THE "PROMOTION PERIOD"). ELIGIBILITY: The "It's Your Move" Contest (the "Contest") is only open to deviantART members (membership is free at www.deviantart.com, the "Contest Site") who meet the following requirements as of July 12, 2013: at least eighteen (18) years old and a resident of the 48 Contiguous United States, Alaska and the District of Columbia. Membership to deviantART is free. The following are NOT eligible: officers, directors, employees and volunteers of deviantART, Inc., Toyota Motor Sales, U.S.A., Inc., ("TMS"), Lexus, a division of TMS ("Lexus") Saatchi & Saatchi North America, Inc., ("Saatchi") and any of their affiliates or subsidiaries, and any individual domiciled with any such party (collectively, the "Eligibility Requirements"). (TMS, Lexus, Saatchi and Sponsor collectively the "Sponsorship Entities"). 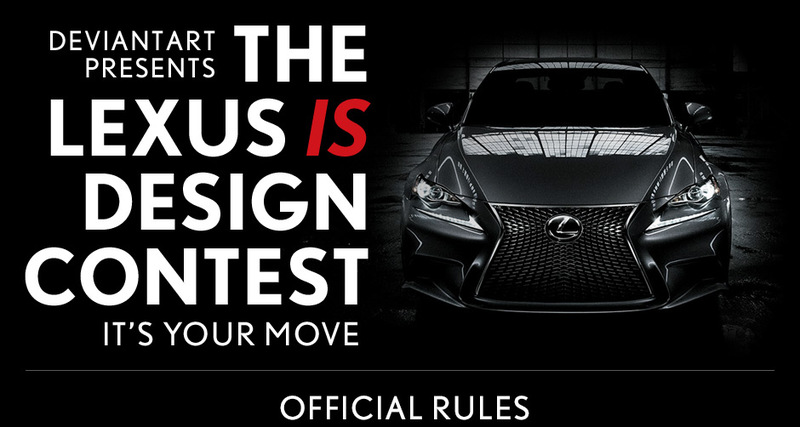 HOW TO ENTER: Entrant must submit a completed entry (the "Work") compliant with these instructions and the instructions at the Contest Site showing Entrant's design and vision for a custom exterior treatment and exterior modification of a 2014 Lexus IS. The Work is not for use as a wrap, not just for use as a poster and the First Place Winner's entry will be used as the basis to modify an actual Lexus IS that will be used for display. The winners will be selected on the basis of a design which is (i) true to the essence of the design for the 2014 IS, (ii) Consistent with the image of Lexus brand, (iii) its Originality, and (iv) potential as an actual executable design. By submitting a Work, Entrant represents and warrants that the Work and any element of it: (i) does not violates the intellectual property or other rights of any third-party; and (ii) does not contain any third party stock images with the exception of licensed brushes and textures; and (iii) the Entrant has sufficient rights in the Work and all elements of the Work to grant the license(s) and/or right granted in these Official Rules. If the Entrant is the First Place Winner, Entrant agrees to make him or herself available by phone or email to collaborate in the adaptation of their Work onto an actual vehicle. LEXUS TRADEMARKS: Any logos, service marks, trade names, trademarks, copyrights, design or visual elements of TMS and/or any of its parent, subsidiary and/or affiliated companies, as represented in the Lexus IS or otherwise (the "TMS Names and Marks") are and shall remain exclusively the property of TMS or its related entities. Entrant shall neither directly or indirectly obtain nor attempt to obtain any right, title or interest in or to the TMS Names and Marks. By submitting a Qualified Entry, Entrant acknowledges and confirms TMS exclusive ownership of the TMS Names and Marks. Entrant may use TMS Names and Marks: (i) during the Promotion Period solely for purposes of creating and submitting a Qualified Entry and solely as an element of that Qualified Entry; (ii) as they may appear as incorporated into and made a part of the submitted Work; provided that the permitted use may be displayed solely for Entrant's personal, non-commercial use and solely on Entrant's personal, non-commercial social media channels. ENTRANT IS NOT GRANTED ANY LICENSE OR AUTHORIZATION TO USE THE TMS NAMES AND MARKS FOR ANY OTHER PURPOSE, WHETHER IN CONNECTION WITH THE WORK OR OTHERWISE. In case of a conflict between this provision and any other provision of these Official Rules or the Contest Rules, you agree that this provision will govern. In the event Entrant's Work is chosen as a Semi-Finalist, First, Second or Third place prize winner, Entrant hereby grants Sponsor and Lexus the following non-exclusive, unlimited, perpetual, royalty-free, sub-licensable license and/or right in and to the Work and/or any element thereof to reproduce, display, distribute and/or perform publicly (including use in digital, audio or photographic recordings, copies or reproductions of the same) worldwide, in any form, in all media, for any lawful purpose and to license the same or adapt the Work for these purposes. Entrant represents and warrants that he/she will not use or permit the use of the Work in any manner that promotes a product or service of any party other than the Entrant. SELECTION OF WINNERS: Judging of the Qualified Entries should conclude on or about August 13, 2013. Twenty-five semi-finalists will be selected by full-time deviantART Staff and judged on the following criteria: (i) consistency with the essence of the design for the 2014 IS (ii) consistent with the image of Lexus brand (iii) originality, and (iv) potential as a actual executable design(the "Judging Criteria"). The Works of the twenty-five semi-finalists will be publicly posted on deviantART in advance of final judging. Only one entry per Entrant may be chosen as a semi-finalist entry. The 1st, 2nd and 3rd place prize winning Works will be selected by a panel of judges consisting of one representative from each Lexus, VIP AutoSalon, MotorTrend, and Calty Design Research, Inc. The judges' decisions are final on all matters relating to the selection of Winners for the Contest. The finalist judges will select one of the judges as the "Presiding Judge." In the event of a tie or other impasse in any portion of the judging process, the Presiding Judge will resolve the tie or impasse to the appropriate number of ranked winners as applicable. Judging of the winners and semi-finalists will be based on each of the Judging Criteria in whatever proportion the judges may determine in their discretion. 1st Place Prize Package: A one-year lease of a Lexus IS F Sport (2014 Model Year) with Navigation Package (the "Prize Vehicle"); All-expenses paid trip to The SEMA Show 2013 in Las Vegas, NV; $2,000 USD; 8,000 deviantART points; and a One-year Premium Membership to deviantART (Total Approximate Retail Value ("ARV") of 1st Place Prize: $15,010.80 USD. ; ARV of the Prize Vehicle: $10,330.80). 2nd Place Prize Package: $1,500 USD; 4,000 deviantART points; and a Six-month Premium Membership to deviantART (ARV of each 2nd Place Prize Package: $1,566.00 USD). 3rd Place Prize Package: $1,500 USD; 4,000 deviantART points; and a Six-month Premium Membership to deviantART (ARV of each 3rd Place Prize Package: $1,566.00 USD). Semi-Finalists Package: 2,000 deviantART points; a three-month Premium Membership to deviantART; and a Lexus Slim Master Hardcover Notebook. (ARV of each Semi-Finalists Prize Package $103.45 USD). Total ARV of all prizes: $21,418.80 USD. Sponsor reserve right to substitute prize of equal or greater value for all or any element of any prize(s). No other substitution or transfer of prizes permitted, and no cash will be given in lieu of a prize. Taxes, license, registration and other fees, and costs if any, are the sole responsibility of prize winners. Sponsor will not replace any lost, mutilated or damaged prizes. Any difference between the stated ARV and a lower actual value of the Vehicle lease as of the date of receipt will not be awarded. Winner must report income to the IRS. In the event it is deemed during the verification process that the potential Winner does not have a unique, personal and valid social security number, the potential winner may be disqualified from obtaining the Prize Vehicle. Valid social security numbers will be determined by IRS requirements. The depiction of the Prize Vehicle in any advertising, promotional materials or displays may not reflect the actual vehicle winner will have to retrieve. TMS will determine all features of automobile including, but not limited to, color of exterior and interior, and all other features or upgrades will be allowed only if permitted by delivery dealer and paid for by the potential winner. At the time of delivery of the Prize Vehicle, the potential winner will be required to satisfy a credit application, must not be adjudged a bankrupt, must be a U.S. licensed driver and will be required to provide proof of valid U.S. driver's license, legally-required insurance and otherwise meet all eligibility requirements contained in these Official Rules. A failure to meet these restrictions, limitations and qualifications and an inability to comply with other requirements specified in these terms may result in the potential winner forfeiting the Prize Vehicle. The verified and qualified Winner is responsible for title, applicable taxes (including without limitation any incremental income taxes and any sales, use, lease or property taxes), license, registration, dealer preparation costs, auto insurance and other fees associated with prize. TMS, Sponsor shall not have any responsibility or liability whatsoever for any property loss, damage, personal injury, or death, in connection with the prize provided pursuant to the Contest and/or any person's participation in the Contest; provided, however, that Toyota Motor Sales, U.S.A., Inc. shall be solely responsible for any express written limited warranties specifically set forth in the applicable Owner's Guide for the vehicle. Winner must take delivery of prize from the automobile dealership designated by TMS. TMS shall not be responsible for delays in delivery of the prize vehicle, and delivery is subject to availability. TMS, however, shall use all reasonable efforts, subject to availability, to deliver the Grand Prize vehicle to the Sponsor-designated delivery dealer within three hundred sixty (360) days of completion of verification process. Winner shall bear all risk of loss or damage to the vehicle after it has been delivered to the winner. Winner must personally retrieve the Grand Prize vehicle within thirty (30) days of written notification of delivery or he/she will lose his right to claim the Grand Prize vehicle. The one-year Prize Vehicle lease will be funded through Lexus Financial Services and the Winner will be required to enter into a lease or use agreement as directed by Sponsor in order to claim his/her prize. Winner may also be requested to complete additional forms as requested by the entity providing the vehicle lease in order to claim their prizes. The Sponsor, in its sole discretion, reserves the right to substitute the 2013 year car lease prize with a cash equivalent equal to the approximate Lexus dealer cost of such lease. DeviantART, Inc. is not responsible for any aspect of the Prize Vehicle and Winner will look solely to Lexus with respect to any matter arising out of the Prize Vehicle, providing and delivery of the Prize Vehicle under the Lease or with respect to the use of the Prize Vehicle itself. Because the one-year lease for the First Place Winner is subject to restrictions, limitations and separate qualification and compliance with other requirements the winner, as a result of those restrictions, may forfeit the lease as a prize. NO SUBSTITUTE PRIZE WILL BE PROVIDED IN THE EVENT THE WINNER DOES NOT QUALIFY FOR THE LEASE. Qualification for the lease is not a requirement for entry into the Contest. VERIFICATION OF WINNERS AND DELIVERY OF PRIZES: Any potential winner will be notified by Note or otherwise through his or her deviantART account. If a potential winner: (i) cannot be contacted; (ii) does not respond within five (5) days from the date the Sponsor first tries to notify him/her; (iii) and/or fails to execute and notarize an affidavit of eligibility and liability/publicity release in the form prescribed by Sponsor and return such affidavit to the Sponsor within 14 days of receipt an alternate potential winner may be selected, at the discretion of the Sponsor. If a prize winner is a minor in his/her jurisdiction of residence (e.g., if a resident of Alabama or Nebraska, is younger than 19 years of age; if a resident of Mississippi, is younger than 21 years of age), then the winner's parent or guardian will be required to co-sign the affidavit and any other documents requested by Sponsor and/or Lexus. If the prize includes travel, the winner will receive round trip economy fare air travel between the nearest major city to the winner's residence and Las Vegas, NV. Sponsors will determine flight and accommodation itinerary in their sole discretion. Sponsors are not responsible for flight or other transportation/accommodation difficulties including cancellation/delay; no refund or compensation will be made in the event or a cancellation or delay in flight; winner is responsible for any travel documentation requirements at their own cost; Entrant acknowledges that the trip package is for the purpose stated and accordingly, if winning a trip package, will make himself or herself available on the dates required and will not be able to substitute the dates for travel and accommodations presented to the entrant by Sponsors; travel is subject to the rules and restrictions set forth in these Official Rules and those set forth by the relevant airline carrier and accommodations; any expense and incidental travel costs not specifically included in the package description are the responsibility solely of the winner, including but not limited to meals and incidentals, ground transportation and luggage fees in excess of miscellaneous travel expense amount, passenger tariffs or duties, surcharges, airport fees, service or facility charges, personal charges at lodging, security fees, taxes , and other expenses; Sponsors will not replace any lost, mutilated, or stolen tickets, travel vouchers, or certificates. Accommodations will be described to the winning Entrant in advance of travel and Entrant will be permitted to make alternate choices for accommodations at the Entrant's sole cost, expense and responsibility. RELEASE: By entering, each Entrant agrees to defend, indemnify, release and hold harmless Sponsorship Entities from and against any and all losses, demands, damages, rights, claims, actions and liabilities of any kind arising out of or related to (i) Entrant's participation in the Contest or (ii) Entrant's participation in any prize-related activities (including, without limitation, any property loss, damage, personal injury or death caused to any person(s) arising from use or redemption of any prize). The winners assume all liability for any injury, death, or damage caused, or allegedly caused, by participating in this Contest or use or redemption of the prize. GENERAL: This Contest is subject to all applicable federal, state and local laws and regulations. Sponsorship Entities and judges are not responsible for late, lost, stolen, damaged, garbled, incomplete, misaddressed, postage due, incorrect or misdirected entries, mail or communications; or for errors, omissions, interruptions, deletions, defects, or delays in operations or transmission of information, in each case whether arising by way of technical or other failures or malfunctions of computer hardware, software, communications devices, or transmission lines or data corruption, theft, destruction, unauthorized access to or alteration of entry materials, loss or otherwise. Sponsorship Entities and judges are not responsible for electronic communications which are undeliverable as a result of any form of active or passive filtering of any kind, or insufficient space in entrant's e-mail account to receive e-mail messages. Sponsorship Entities disclaim any liability for damage to any computer system resulting from participation in, or accessing, posting, uploading or downloading information in connection with, this Contest, and reserve the right, in their sole discretion, to modify, cancel, terminate or suspend this Contest should any virus, bug, technical failures, unauthorized human intervention or other causes beyond Sponsor's reasonable control corrupt or affect the administration, security, fairness or proper conduct of the Contest. In the event of any such cancellation, termination or suspension, a notice will be posted on the Contest Site and the winners will be selected from among all eligible entries received prior to such time. Sponsorship Entities reserve the right, in their sole discretion, to disqualify any entrant from this Contest or any other promotion conducted now or in the future by Sponsor or any of their affiliates if the entrant's fraud or misconduct adversely affects the integrity of the Contest. By participating in this Contest, each entrant accepts the conditions stated in these Official Rules, agrees to be bound by the decisions of the judges and warrants that s/he is eligible to participate in this Contest. By accepting a prize, winner agrees to release Sponsorship Entities and their respective directors, employees, officers, and agents, including without limitation, their advertising and promotion agencies, from any and all liability, loss or damages arising from or in connection with the awarding, receipt, and/or use or misuse of the prize or participation in the Contest or in any prize-related activities. DISPUTES: Participant agrees that (1) any and all disputes, claims, and causes of action arising out of, or connected with, this Contest (including without limitation, any alleged violation of these Official Rules, any controversy relating to the arbitrability of any dispute, or any claim that these Official Rules (or any part thereof) are invalid, illegal, or otherwise voidable (or void)) shall be resolved individually, without resort to any form of class action, and exclusively by arbitration to be held solely in Los Angeles, California under the auspices of the American Arbitration Association and pursuant to its Commercial Dispute Resolution Rules and Procedures; (2) any and all claims, judgments, liabilities, and/or awards shall be limited to actual out-of-pocket costs incurred, including costs associated with participant's participation in this Contest or otherwise accessing this Contest, but in no event attorneys' fees; and (3) under no circumstances will you be permitted to obtain awards for, and participant hereby waives, all rights to claim, punitive, special, incidental, and/or consequential damages and any other damages, other than out-of-pocket expenses, and any and all rights to have damages multiplied or otherwise increased. SOME JURISDICTIONS DO NOT ALLOW THE LIMITATIONS OR EXCLUSION OF LIABILITY FOR INCIDENTAL OR CONSEQUENTIAL DAMAGES, SO THE ABOVE MAY NOT APPLY TO YOU. Judgment upon the arbitration award may be entered in any court having jurisdiction thereof. This arbitration provision shall be deemed to be self-executing, and in the event that either party fails to appear at any properly noticed arbitration proceeding, an award may be entered against such party notwithstanding said failure to appear. In no event shall participant seek or be entitled to rescission, injunctive, or other equitable relief or to enjoin or restrain the operation of this Contest, exploitation of any advertising or other materials issued in connection therewith, or exploitation of this Contest or any content or other material used or displayed on this Contest. All issues and questions concerning the construction, validity, interpretation and enforceability of these Official Rules, or the rights and obligations of the entrant and Sponsors in connection with the Contest, shall be governed by, and construed in accordance with, the laws of the State of California, without giving effect to any choice of law or conflict of law rules (whether of the State of California or any other jurisdiction), which would cause the application of the laws of any jurisdiction other than the State of California. CAUTION: ANY ATTEMPT BY AN ENTRANT TO DELIBERATELY DAMAGE ANY WEBSITE OR UNDERMINE THE LEGITIMATE OPERATION OF THIS CONTEST IS A VIOLATION OF CRIMINAL AND CIVIL LAWS. SHOULD SUCH AN ATTEMPT BE MADE, SPONSOR RESERVE THE RIGHT TO SEEK DAMAGES FROM ANY SUCH INDIVIDUAL TO THE FULLEST EXTENT PERMITTED BY LAW. WINNERS LIST: To obtain winner's list, go to www.deviantart.com. Winners list will be available after selection and verification of winners. SPONSOR: deviantART, Inc., 7095 Hollywood Blvd., #788, Hollywood, CA 90028. QUESTIONS REGARDING THIS CONTEST? Go to www.deviantart.com. PLEASE NOTE: THESE OFFICIAL RULES TAKE PRECEDENCE OVER ANY TERMS OR RIGHTS TO THE CONTRARY SET OUT IN DEVIANTART'S TERMS OF SERVICE, SUBMISSION POLICY OR ETIQUETTE POLICIES AND ANY SELECTION OF A CREATIVE COMMONS LICENSE WITH RESPECT TO YOUR ENTRY WILL BE TREATED AS NULL AND VOID TO THE EXTENT NOT CONSISTENT WITH THESE OFFICIAL RULES. By entering this Contest, you ("Entrant") accept and agree to be bound by these Official Rules. Any violation of these rules may, at Sponsor's discretion, result in disqualification. All decisions of the judges regarding this Contest are final and binding in all respects. By participating in the Contest Entrant represents and warrants that he or she meets the eligibility requirements and an Entrant and has read, accepts and will comply with these Official Rules. Entrant acknowledges that any violation of these Official Rules may disqualify Entrant from the Contest. By clicking on the Upload Your Artwork button below, you agree that you have read and understand the terms and conditions, and agree to be bound by, the above Official Rules.